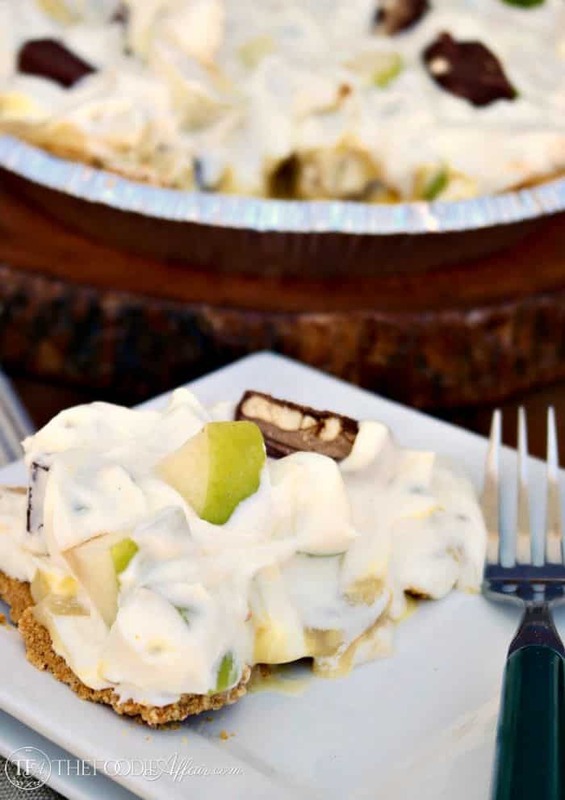 No Bake Take 5 Apple Pie is a delicious combination of chopped candy bars and apples folded into pudding and whipped cream! Hope you had a great holiday weekend! Those three wonderful work-free (from the office at least) went by so fast! We stayed close to home, rode our bikes through an old Army base (Fort Ord), and I also had an opportunity to revamp this Snicker Salad and share it at a pizza party! Are you familiar with Snicker Salad? It’s pure goodness and is always a hit when I make it. How can you go wrong with candy and apples, right? Plus, it’s one of the easiest recipes to put together because there is no baking involved and all the ingredients can be purchased off the shelf! When I was gathering the ingredients my eyes just about popped out of my head when I saw bags of Take 5 fun size candy bars. Whattt? Take 5?! This candy bar isn’t in the stores year round (at least where I live). It usually is reserved for the Halloween rush. Well, I guess the season is here, so I grabbed a few bags and thought it would be perfect to update the old standby Snicker Salad with Take 5! 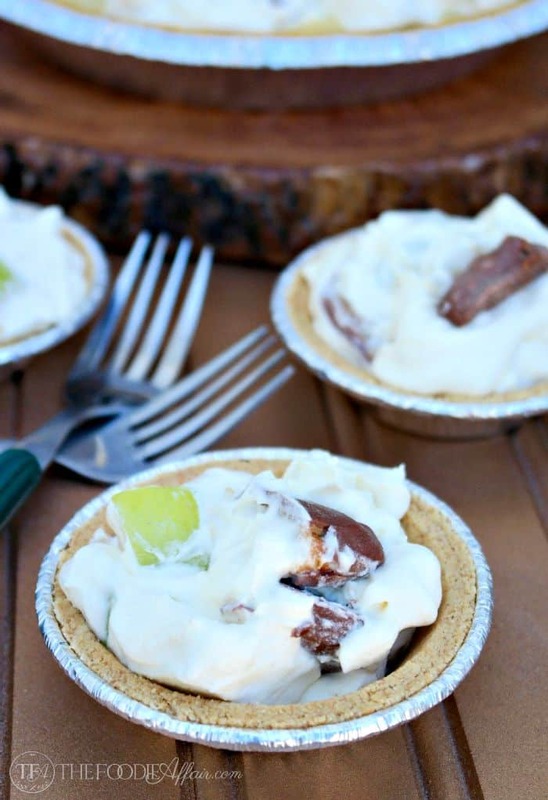 The crunchy pretzel pieces in the candy is so good with the creamy pudding, whipped topping and tart apples! 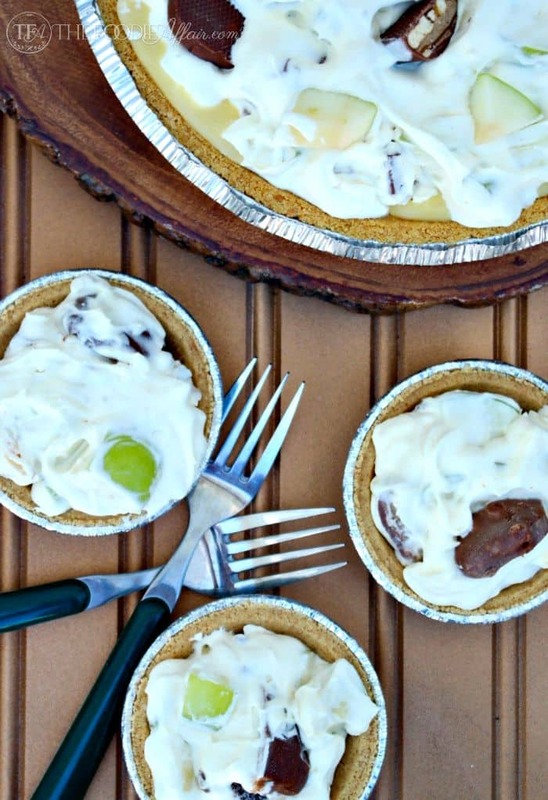 You can serve this Take 5 Apple Pie the old fashioned way by dishing up a scoop or serve it in mini pie crusts or a couple of large pies! Make sure every serving gets at least a couple of pieces of candy otherwise someone will be picking through the leftovers for their fair share! In a large bowl, mix milk with pudding mixes. Remove one cup of the pudding and set aside. 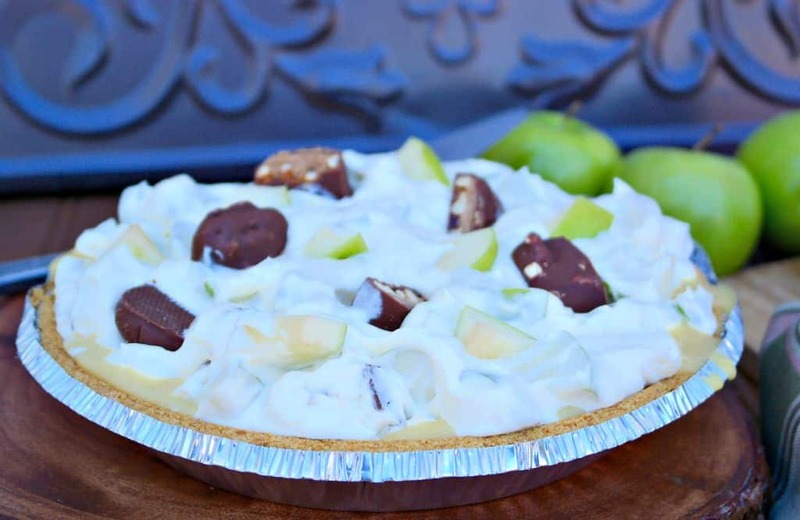 Fold in whipping cream and once combined add apples and candy bars. Add 1/2 cup of prepared jello to the bottom of the pie crust spreading on the bottom of the crust. For mini crusts use 1 tablespoon. Add pie filling and refrigerate or freeze for an hour before serving. Sounds delicious! I’ve never seen Take 5 candy bars before. I’ll have to watch for them. They’re a heavenly treat, Mary Ellen! Yes, keep an eye out because they won’t last long in the stores! I’m in heaven! 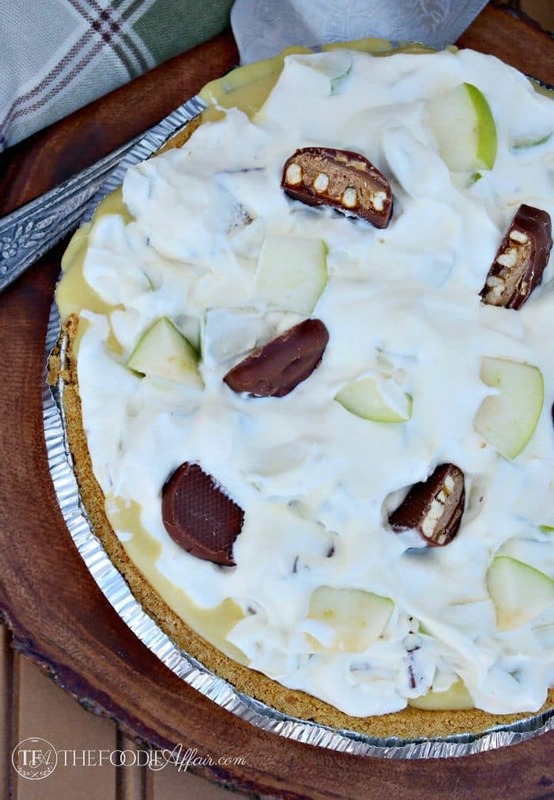 All that whipped cream, apples and candy bars! 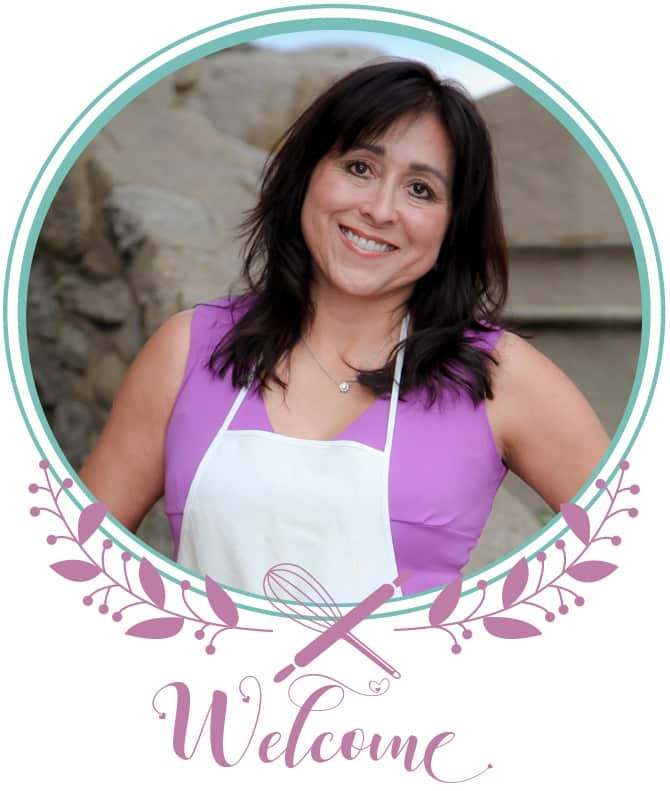 Great recipe Sandra! Ready in no time and who wants to turn on the oven in the heat were having right now! 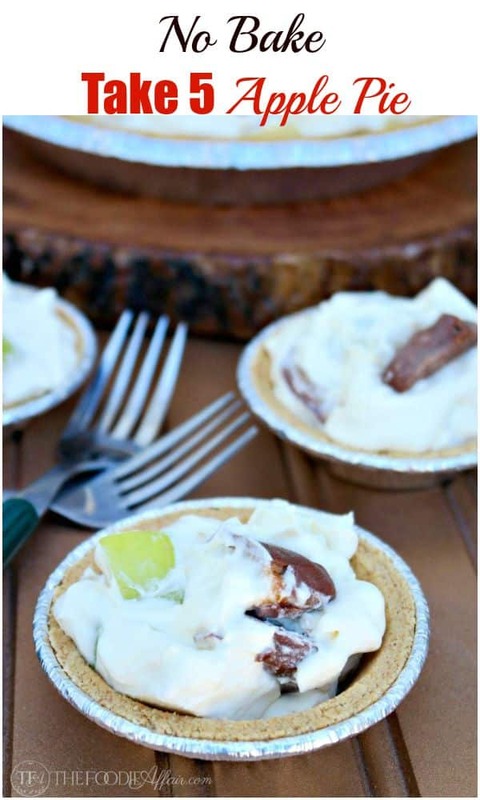 I am a huge fan of Take Five Bars, so I know I’d love this pie!!! Oh my word, I wish I was enjoying a piece right now! Love the revamp of a classic recipe too! Snickers is soooo outdated, right? haha! 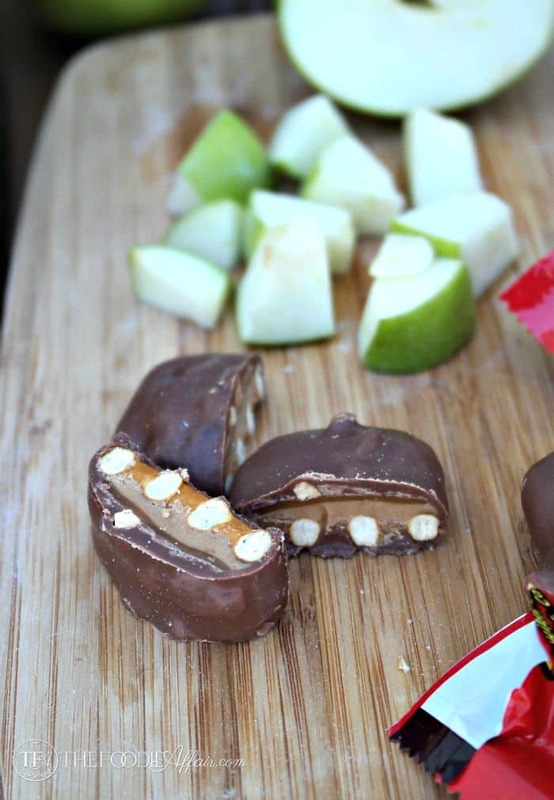 Fun recipe to make and so good with Take 5 candy! That is one loaded pie. Love the fact it is a no bake pie. Maybe you can change the tittle to take 5 in just 5. A snap to put together. Love that. Pinning and sharing! Oh, I like the play on words. Thank you, Bobbie! Sandra, the apple pie looks scrumptious! I like the idea of adding candy bars. I’ve never had Snicker Salad before but I’m positive its yummy! I love your pie version with the Take Five!